The indicator shows the estimation of damage caused by natural disasters that are made by the competent national commission or municipal commissions through direct inspection of means and goods in private and other ownership that were affected by any form of natural disaster-related damage. Natural disasters are a result of natural phenomena (earthquakes, floods, fires, drought, storms, hail, frost, land and snow sliding, infectious disease outbreaks in humans, epizootics, pests, ecological disasters, etc. ), human activity and actions, when various events get out of hand (for example when performing an activity, managing a work facility, or when handling dangerous substances) and pose a threat to the lives or health of people or animals, property, cultural heritage or environment. The analysis of the data collected covers the causes of natural disasters and the percentage of estimated damage in relation to Slovenia’s annual gross domestic product (GDP). -To improve the availability of water quantities intended for use and to improve water status and the associated ecosystems to minimise the impact of hydrological droughts. Since natural disasters are unpredictable, the scope of damage varies from year to year. The most frequent natural disasters are earthquakes, thunderstorms, and fires. According to some findings, climate change that can be attributed to human activity is one of the reasons for more intense extreme weather conditions and the damage that this causes. According to the data of the Statistical Office of the Republic of Slovenia, a major scope of damage after elementary (i.e. natural and other) disasters was caused by extreme weather conditions. 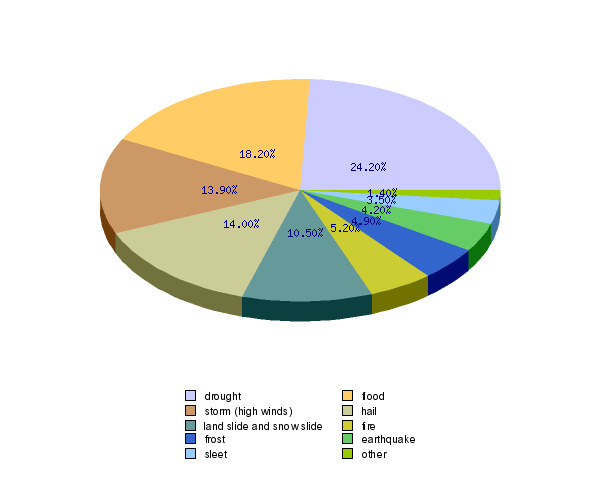 From 1994 to 2005, 70% of all damage can be attributed droughts, floods, hail and strong winds. The scope of damage varies between the years; on average, however, it equalled at least 0.55% of annual gross domestic product during the mentioned period. According to the estimate of the Administration for Civil Protection and Disaster Relief, which also monitors direct costs related to damage caused by natural disasters, this share is considerably higher, and amounts to 2% of the GDP. In 2005, the highest damage was caused by hail and thunderstorms, namely, 74,77 thousand EUR (SIT 10,441 million), and 42,3 thousand EUR (SIT 5,907 million), respectively. The largest damage was recorded in the Spodnjeposavska and Savinjska regions. Worst-hit were the agricultural sector and forestry. 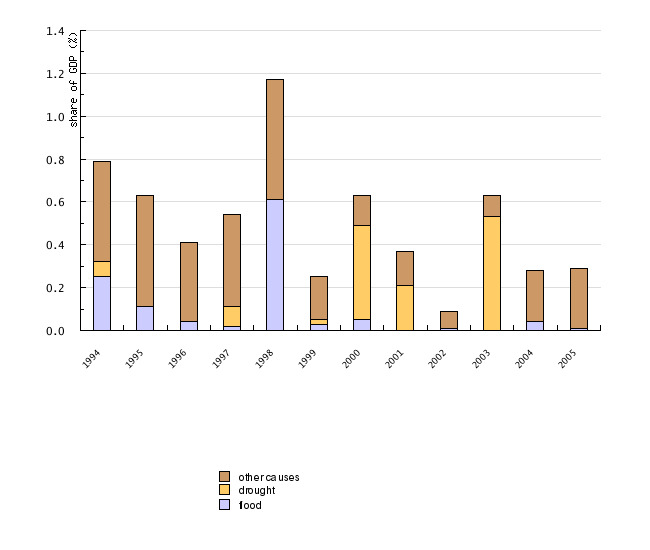 However, in the 1994-2004 period, the greatest damage was caused by droughts (24.2%) and floods (18.2%). In 2003, a systemic law was adopted for repairing the damage caused by natural disasters - the Removal of Consequences of Natural Disasters Act. In light of the adopted law and other regulations, it is possible to predict a gradual decrease in expenditure. Special emphasis shall be given to the drawing up of maps of areas potentially endangered by natural disasters (earthquakes, floods, droughts, and landslides). The aim of their use will be the protection from direct or indirect threats of natural disasters and the provision of measures required to prevent and mitigate the consequences thereof. The maps will also serve the purposes of spatial planning and protection from impending threats. The steps thus taken will contribute to the reduction both in the scope of damage and the amount of expenditures arising from natural disasters. Data published in the SI-STAT database, available on the Statistical Office of the Republic of Slovenia's website, was used. Data on the estimation of damage made by competent commissions is presented separately, by municipality, for each natural disaster. This information is obtained from competent municipal commissions, the national commission for damage estimation or other professional services. The competent commissions assess the type of damage by cause, region, assets that were affected, and activities during which the damage occurred, and assess the value of losses. In completing the mentioned reports, municipalities observed the Regulation on Methodology to Assess Damage Caused by Natural Disasters (Official Gazette of the RS, No. 67/03). However, due to incomplete reporting and methodological problems, the data is incomplete. To calculate the composition of the estimated damage by cause in the 1994-2005 period, the annual values were deflated by CPI.